For years I have been calling for more talent at the linebacker positions via the draft. There is the argument that it is a group simply not needed for 4-3 defensive success but I have always strongly disagreed. The impact that three powerful, fast, and versatile linebackers can have on a defense is huge. This is a group that lacks star power but there are plenty of guys that can fill roles. Beason and McClain are now in their 30s with lateral movement issues, but they can more-than-get-by with their instincts and quick reactions. They are the vocal leaders of this defense. Kennard had the brightest upside of this group, showing inside/outside versatility and the talent to be an impact defender. Thomas and Casillas are both athletic linebackers that will bring an overly aggressive nature to this group, something they have lacked over the years. At the very least both of them will have a strong impact on special teams. Herzlich and Manning are easily replaceable and they will have to work hard to fend off younger, more athletic version of themselves throughout the preseason. The rest of the names up there are training camp bodies, although I had a high grade on Unga when he came out of BYU. I’d like to see what he can bring to the table in this defense. Strong Points: Quick thinker and mover within the tackle box. Diagnoses the running lanes and takes the right angle towards the action to miss the meat of a block. Fast transition from shuffle to explosion downhill. Very agile and can play fast with easy bending. Closes the gap in front of him fast. Hard tackler with mechanics and consistent results. Very aware of the action around him. Shows a lot of necessary tools to defend the inside run. Good blitzing linebacker from all angles. Can wiggle his way through the line and reach the passer consistently. Weak Points: Becomes less and less effective the more he moves away from the point of attack. Struggles to change direction in space. Can be outraced to the sideline by faster rushing attacks. The instincts in coverage do not match what he can diagnose against the run. Will play high at times, exposing too much of his chest to the blockers. Summary: 1st Team All ACC defender that builds his game off of awareness, strength, and tackling ability. Anthony is a quality inside run defender with quick, powerful downhill ability. While he is athletic enough to play in the NFL, he may not be considered a 3 down linebacker. This brand of NFL defense has taken a slight step backward but he can still carve a nice niche for himself at the next level. Smart defenders with strength, power, and downhill ability will always be in demand. Probable starter for most schemes but he needs to use his athleticism in coverage more to be considered a great three down linebacker. *I saw Anthony twice in September and both times I came away with a negative impression. I penciled in a 3rd round grade and went on from there. As the season progressed I kept on hearing his name from some people I really respect and I was convinced to take a look at some of his games from the second half of the season. With those in mind and what I saw during the pre-draft process, Anthony cemented himself as the top linebacker grade I’ve given out in 3 years. He is a guy that could likely start at MIKE or WILL in the Spags scheme from day one. He isn’t an elite cover guy but he can evolve in to a better one considering his top tier athletic ability. I’m not sure I could spend a top 10 pick on a guy like this, but he will be in my top 12 overall. He’d be a great 2nd rounder. Strong Points: Ultra productive and reliable tackling machine. Has a nose for the ball. Quick thinker, sees the offense well and has a natural flow towards the action. Can fight his way under blocks. Quick and light feet but maintains a power presence. Good lateral pursuit to reach the sidelines. Aggressive and strong on the move, can deliver a violent pop no matter where he is on the field. Will drive his body through the ball carrier and consistently get them to the ground. Efficient mover in coverage. Rarely gets caught out of position or moving in the wrong direction. Can turn his hips and stick with receivers up the seam. Can reach proper depth when dropping in to coverage. Weak Points: Lacks the ideal size from a between-the-tackles linebacker. Light in the pants and doesn’t have a long reach. Average movement in pursuit. May not have the speed-based range to play all over the field. Won’t take blocks and anchor his position. Summary: Butkus Award winner. Nation’s leader in solo tackles in 2014 and 2012. Two time team captain and has won a couple leadership awards. Kendricks lacks the ideal tool set that coaches look to use in the NFL. He is slightly undersized and lacks the top tier speed and strength. All he does is produce, however. He reads the action as good as any player in the nation is consistently in a position to make plays. He is a reliable, heady player that will direct traffic and quarterback the entire defense. His knack for locating the ball and taking down whoever is carrying it will get him on the field. His size may limit him to the weak side but he will be as reliable as it gets. *Superstar linebacker? I don’t think so. But Kendricks is going to be a very solid player in the NFL and I have no doubt about it. He is a really safe pick. He lacks a couple of ideal size aspects but he is as smart as it gets and doesn’t miss tackles. Down the road I think he can be a MIKE but I think he could be a 100+ tackle WILL right away. He would fit this defense right now as well as any linebacker in the class. Spending a 2nd rounder on him would be a solid value. Strong Points: Thick, country strong linebacker that can drive himself through a ball carrier with consistency. Angry tackler with a power presence. Quick mover and an even quicker thinker. Brings a lot of force to every hit he makes. Can react to the action right after the snap and get himself in to position. Makes himself small to blockers and will sneak his way to the action. Low center of gravity. Great body control and balance. Explosive when moving downhill. Head is always on a swivel. Able to diagnose plays based on what is going on around him. Weak Points: Lateral range is average. Struggles against the faster offenses to reach the sidelines. The further in space he gets, the lesser of an athlete he looks like. Won’t get off blocks fast enough. Looks overwhelmed when linemen have a free path to him. Gets lost in the traffic. Will have a hard time seeing through and/or over blockers. Size and speed may be a limiting factor at the next level. Summary: 3rd Team All American and Finalist for the Butkus Award. Has been the leading or second leading tackler for Miami all four years of his career. Equally productive as an outside or middle linebacker. Perryman is an instinctual mover that is almost always in position to make a play against the run. He is an elite tackler that combines form and power. Leader of the defense with a lot of responsibility directing traffic around him. There are holes in his game that mainly come from a lack of size and speed but he is a true gamer that will find a way to make an impact each week. Future starter in the NFL at almost any linebacker position other than the 3-4 OLB spot. *There are some people that hate Perryman and some that love him. I’ll be very interested to see where he goes draft weekend, as I have him graded as a 1st rounder but I’ve heard as low as round 4 from people with connections to teams. Perryman would be an ideal WILL in the Spags scheme from a run defending perspective. Yes, he may need to be taken off the field on passing downs but you know what? You need to get to third down. If you can’t stop the run, you won’t make it to 3rd down. Perryman is a bigger asset against the run and short passing game than he is a liability against the intermediate and long passing game. He is worth NYG’s 2nd rounder for sure. Strong Points: Athletically gifted and tools-rich. Versatile athlete that lines all up all over the field, capable of wearing different hats. Explosive and fast athlete in space. Can turn speed in to power quickly. Functionally strong in short areas, can deliver a violent pop to blockers and ball carriers. Incredible wingspan and reach as a tackler. Wraps up and swallows his target after powerful initial contact. Effective blitzer. Can get off blockers using different ways to shake free. Bends well and can play a low pad level game. Strong hands to grip and rip off a blocker. Effective in coverage with loose hips and quick acceleration. Has the speed to hang with receivers in space. Weak Points: Better athlete than he is a football player. Lacks the quick reactions and plays a lot of catch up. Delayed reads when in traffic. Doesn’t keep his head on a swivel and will be tricked by play action and counters. Takes too many false steps. Doesn’t get himself in position to make plays against the inside run consistently. Struggles to anchor his position via strong presence from his base. Summary: Fourth year junior entry. All American. Top tier athlete for the position that gradually improved his overall level of play throughout the 2014 season. Was also an accomplished high school quarterback and basketball player. McKinney is one of the most explosive 250 pound athletes in the nation. He is an easy mover that creates a tremendous amount of force in short areas. His physical gifts outweigh his skill set at the moment, but he is steadily improving the nuances and reading ability of the linebacker position. His upside and potential are among the best in this draft class. *When a prospect is a better athlete than what he shows on tape, I’m always worried. McKinney has all the size you can ask for and he is as explosive as some of the top wide receivers in this draft class. The issues is he doesn’t always display that kind of ability on tape but even his biggest opposers have to admit the light started to come on for him in 2014. He showed enough to me to warrant a high 2nd round grade because of where I think he will be in another year or two. McKinney is a similar talent to Kennard but I think there is a higher upside with him. If he continues to mentally and physically develop, he could be a star in the NFL. But I would project a potential “bust” with him more so than anyone on this list. Huge risk/reward. Strong Points: Explosive, all over the field type athlete. Easy mover in space, has defensive back-caliber hips and footwork in coverage. Closes a ten yard gap as fast as any defender in the nation. Aggressive downhill tackler, will meet the ball carrier at the point of attack and stifle him with a strong initial pop. Hits hard with or without a running start, shows enough quick twitch power to handle between the tackles duty. Easily reaches the edge and tackles well on the move to the outside. Diagnoses quickly and reacts to the action without hesitation. High football IQ, aware of his positioning and where he needs to be. Has a knack for the big play. Weak Points: Gets lost in traffic and overwhelmed by the bigger blockers. Will over pursue and create cutback lanes for ball carries. Chooses to run around the action rather than filling lanes. Struggles to consistently follow assignment football. Doesn’t wrap up consistently, needs to show more discipline with wrapping up. Needs more strength and size to handle a head on blocker. Summary: Junior entry. First Team All American. Scored four touchdowns as a defender in 2014. Also played running back, finishing the year with 61 carries (7.48 avg) and 2 touchdowns. Versatile athlete that can fit in to several roles on defense. Former safety five start high school recruit. The speed and explosive athletic ability are elite. Thompson has developed the power and strength elements of his game, giving him the all around skill set to play every down in the NFL. He has sideline to sideline range and can even cover wide receivers in space. If he can continue to physically develop, Thompson has All-Pro potential at the next level. *Interesting prospect here. Watching highlights of him and it’s hard not to dream of what he could do for the NYG defense. To get a real feel for who he is though, you need to watch 2-3 games in their entirety. Thompson looks overwhelmed for 3-4 plays in a row, then all of the sudden blockers can’t touch him and he’s finishing ball carriers off like Ray Lewis. Thompson is very role-specific and that’s what prevented me from giving him a round 1 grade. However, if a defense can let him do what he does best, he’ll deliver. And you know what? It wouldn’t hurt to have him in the offensive backfield as a short yardage back as well. I think he’ll eventually get in to that role in addition to being a defender. He showed very good RB skills. Strong Points: Wiry-strong frame with easy bend and mobility. Shows light feet with an explosive lower half. Can change direction with ease and will reach his top speed quickly. Smart player that reads the action. Consistently puts himself in position post-snap to impact the play. Can be slippery to blockers with his combination of bend-ability and quickness. Violent tackler. Delivers a strong jolt to the ball carrier, will snap helmets back. Easy mover in coverage, can flip his hips and react to the passer’s eyes. Weak Points: Body control isn’t always there. His mind moves faster than his body. Will over-pursue and lose track of backside pursuit responsibilities. Speed to the sidelines is sub-average. Gets too hands-on in coverage. Struggles to break free from blockers that get their hands inside. Gives up too much ground against straight ahead blockers. Summary: Fourth year senior and three year starter. Led the Terps in tackles two of the past three years. Farrand is an overlooked but fully capable linebacker with the tools, skills, and toughness to be an NFL starter. He is smart and instinctive before and after the snap. He pursues like his hair is on fire and finishes his tackles as if the ball carrier just kicked his puppy. Farrand is a three down player that may lack some top end speed, but has more than enough to factor in any kind of scheme in almost any kind of linebacker role. He will out produce many linebackers that are drafted ahead of him. *So every year there is a linebacker or two that I am MUCH higher on than everyone else. This year, it’s Farrand. He wasn’t invited to the combine or the Senior Bowl and a lot of people I respect say he may not get drafted. It hasn’t deterred me from having a 2nd round grade on him. Farrand is a fun player to watch, the motor never turns off and he can fly all over the field. I like LBs that are constantly around the action. Farrand is rarely found away from the ball at the end of a play, he is a natural read and react defender. Athletically he has good size and put together a very impressive Pro Day performance. He is a much more athletic and more physical version of what NYG has in Herzlich. He is going to out-produce several guys drafted ahead of him. 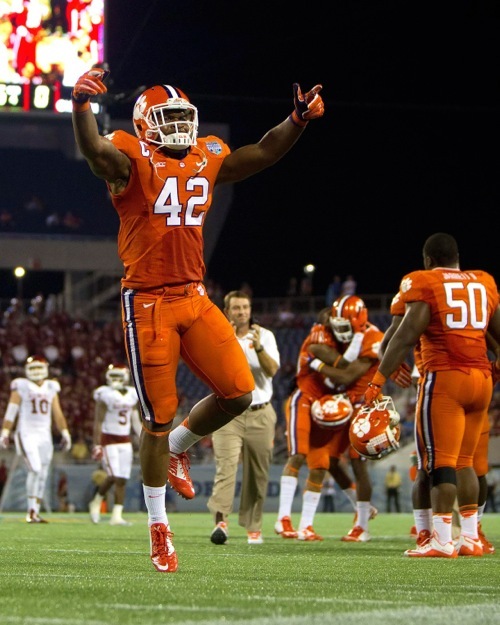 *Jones is another thumper that could excel as an NFL run defender day one. When looking at his size, he has the natural gifts that NYG usually looks for with long arms and big hands to go along with a thick frame. Jones is as physical as it gets when it comes to taking on blockers at the point of attack and will make plenty of plays in the tackle box. He is likely a MIKE-only and may be best suited in the 3-4 scheme, but he could be a nice option for NYG to have is Beason doesn’t work out due to age and injuries. Strong Points: Fast reaction and great pre-snap reads. Gets himself in to position to make plays consistently. Minimal false steps, almost always moving in the right direction. Sure mover that can generate speed and power. Does not get fooled by counters or play action. Gets proper depth in coverage. Keeps his head on a swivel and will read the routes and quarterback simultaneously. Sneaks by blockers and has a nose for the ball. Good tackler, wraps up with good technique and good power. Effective blitzer, times it well and explodes out of his two point stance. Can use his hands and feet to get off blocks. Aggressive and sure minded. Weak Points: Undersized for playing between the tackles as much as he does. Light in the pants. Doesn’t have staying power against blockers. Can be ridden out of a play if he doesn’t get the initial positional advantage after the snap. Limited athlete when pursuing to the outside, may not have that lateral range to reach the sidelines. Limited starting experience at the Division I level. Summary: 2014 SEC leader in tackles. Former JUCO All American that has only one season of starting experience at the Division I level. Broke out in a big way in 2014. Spaight forced his way on to the national radar with a consistently productive season. He is one of the smartest pre and post snap defenders in the nation. He is constantly moving in the right direction and he knows how to locate the football and finish. He is not an elite mover and there are athleticism deficiencies, but players like this find a way on to the field and produce when given the opportunity. He may never be elite, but he will be reliable. *Leading a conference like the SEC in tackles doesn’t weight lightly in my mind. Spaight lacks some of the talent and explosion of some of the top guys in this group, but it’s hard not to really like him after watching a few games. He is as good as it gets when it comes to taking a correct first step and working his way to the action. He is smart and savvy, a perfect general for the middle of any defense. Is he better suited for the 3-4? Sure. But he can hack it as a future MIKE for NYG while possibly bringing something to the table as a WILL right away. Strong Points: Packs a hue punch, outplays his size. Violent and powerful tackler that will deliver a jolt to the ball carrier. Generates a lot of power within a short space. Attacking, downhill-type defender. Has the speed to reach the sidelines as well. Diagnoses quickly and moves with his eyes. Can get in to position with savvy decision making and quick, last second movement. Can make himself small and wiggle his way through traffic. Will meet blockers at the point of attack with aggression. Reliable tackler in traffic and in space, can make any kind of tackle. Weak Points: Lacks the ideal size for play between the tackles. Will get overwhelmed and driven out of the play by blockers with a clean shot at him. Doesn’t use his hands to shed blockers, gets locked on to. Stiff in coverage, doesn’t turn and change direction with fluidity. Needs a lot of recovery time as a pass defender. Summary: Fifth year senior, started all four seasons in the middle or the weak side. Led USC in tackles three of his four seasons. Pullard came to USC with a lot of hype and he performed at a high level through the end of his career there. He may not have the ideal size, but Pullard plays big and can add a violent, aggressive element to an NFL defense right away. He may be restricted to the weak side because of his lack of size and ability to deal with blockers, however. He will need to improve his performance against the pass if he wants to be more than a two down linebacker at the next level. At the very least, Pullard has the potential to be a star special teamer with the potential to be a solid contributor on defense as an athletic, rangy run defender. *Pullard may have never reached his superstar status that many thought he would, but he is still a very good LB prospect. He can fit in to any scheme and will likely be able to play all three downs if need be. Pullard lacks explosion but he is quick at the point of attack and he knows how to finish. Very reliable tackler and he’ll make more plays than you think. Special teams demon and probably starter within a year or two at WILL or MIKE. Strong Points: Sound technician. Quick thinker with consistent flow towards the action. Hard hitter that wraps up while trying to run through the ball carrier. Good back side pursuit. Takes good angles towards the ball and will make plenty of tackles on the other side of the line. Good straight line speed. Comfortable in space. Easy mover in coverage with light feet and loose hips. Productive and effective blitzer. Weak Points: Gets lost in traffic. Reacts too slowly after diagnosing the blockers. Will play too high and gets locked on to by linemen. Short area quickness and explosion isn’t there. Torn ACL in the Spring of 2013. Summary: Fifth year senior and two time team captain. Considered to be the leader of the Wolverines defense. Blue collar player. Ryan has played a couple of different positions, proving to be productive no matter where he lined up. He led the team in tackles in both 2012 and 2014 while showing the ability to be a true three down player. He may not have the movement ability and natural nose for the ball to be a starter right away, but he can factor as a quality backup and special teamer. *A couple years ago Ryan was heading towards an eventual 1st round grade but a torn ACL and lack of speed development later, he’s entering his class with a 3rd round grade on my sheet. He is definitely a serviceable guy that will get a shot at some point, just not sure there is an upside here that you would choose over others guys in the class. He did have a few games in 2014 where he showed flashes of prospect with a higher grade. I like his approach and toughness. You could do much worse than him but he may need a specific role. *He ran a 4.77 at the combine but I think Wilson may have the best lateral range from inside of all the LBs in this class. He is a quick accelerator that constantly plays with top tier effort and toughness. He could use more lower body strength but I think he’s a guy that screams Cover 2 defense type roles. He can help a defense looking for more athletic ability. *Undersized but tougher than everyone he plays against. It is fun to watch a guy weighing under 230 pounds beat the crap out of tackles and guards. Alexander does that but also shows the speed to reach the sidelines and shadow tight ends in coverage. Put him in the right scheme and you may have a Lavonte David type defender. *He was viewed as a 1st rounder by some this past fall. He had a horrific combine and some reports have surfaced that he is a bad teammate and poor practice guy. I downgraded him a few points because of it. As a between the lines player, Dawson is versatile and brings playmaking ability. He isn’t a guy that fits a role though, as he roams too much and can really hurt a defense because of his approach. There is a lack of discipline here that appears on and off the field. *Has the NFL body already and could handle the physical part of the game week 1 of the season. Some view him as a 3-4 OLB only but I think this could be a hybrid that NYG has been searching for but with enough movement ability to factor in coverage packages as well. He could be a nice SAM here in NY. *Interesting guy here. If I had to give another name of a guy that I think will out-perform several others that are drafted ahead of him, it’s Keyes. He played an interesting, rush linebacker type role for the BC defense. There were times where looked unblockable against some of his best competition. I think this kid is a gamer and he’s added some needed weight in addition to an impressive pro day performance. If he can show he is more than an undersized rush linebacker, I think he can be a big time defender. Tackling machine that excelled at moving his way through traffic and locating the ball. He is fast, smart and savvy. He can avoid the meat of blocks and doesn’t need much to produce. He can create on his own with a combination of instincts and quick feet. Special teamer that could produce his way in to a bigger role. *Similar to Hager and Heeney from a read and react point of view but a slightly lesser athlete. Hull can get locked on to and will get overwhelmed more often than I like. But he simply won’t miss tackles and could likely give a team 100+ of them in year one if he started right away. Just not sure I see the upside here. *Another tackling machine here that raised eyebrows at the combine with probably the best workout among all the LBs. He put up defensive back type results. Heeney can play with that kind of speed and quickness but there are countless examples on tape that he struggles to finish off plays. He missed more tackles than any defender in the country in 2014. He is a special teamer that can backup spots in the NFL, but I think he lacks “it”. *Between the tackles thumper that has more speed to his game that I initially thought. He can reach the edges and he maintains power on the move. Quality MIKE/WILL blend in the Spags scheme that could add some special teams presence as well. *One of the most impressive athletes of all these linebackers and he is a guy that started to click mentally in 2014. Someone is going to him enough to spend a day 2 pick on I think. I’m not as high but the upside is higher than most of the guys he is grouped with. I would rather this kind of athlete factor better in coverage than what Hicks showed. This LB group is stronger and deeper than any of what I’ve been grading over the past 5 years. There are several MIKE-type linebackers that could fill in at WILL and even a few that could play an athletic SAM role. There isn’t a whole lot of demand for LBs in the draft, as it seems really good grades always fall to day three. With the amount of depth in this group, I could see a good amount of day 2 grade being available in rounds 4 through 6. With that in mind, it may be too tempting to keep passing on these guys despite the need at LB not being huge. There are a lot of LBs on this roster already. One could make the argument that NYG is fully stocked there and bringing in a rookie would force an unnecessary cut. While the need at LB isn’t what I labeled it to be over the past few years, I would gladly bring in anyone of these kids and get Herzlich off the roster. I know he brings special teams presence and backs up multiple positions, but I’m confident a lot of these kids could as well while offering more long term upside. The MIKE is filled by Beason, fine. Kennard will play SAM and possibly roam through different spots depending on the package. But the rest of the names are not far and away better than the top guys on this list. LB is definitely an option on day two. As I said earlier, if NYG can bring in a big time player to the second level of the defense, we could see things change in a way some simply don’t know exists.